Mechanics with their hammer tools pose along with administrative staff. 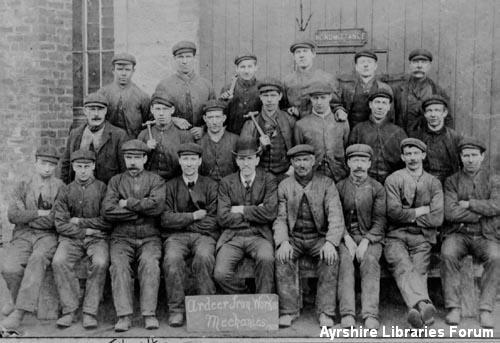 Ardeer Ironworks were founded in 1849. At the time of this photograph the Ironworks belonged to Glengarnock Iron & Steel Co Ltd, which was later absorbed by Merry & Cunninghame Ltd, and closed around 1931. The man in the front row, third from left, was Joseph (Joe) Hamilton, and the man arrowed in the top row was Tom Millar. Both men emigrated to South Africa circa 1910.